Choosing a high quality and most reliable hosting for your site is extremely important. Selection of right host and package can improve your website’s performance, SEO and overall user experience to boost the sales as a whole. A good host takes care of everything about your site and supports you every step of the way. Since it doesn’t require a lot of resources, there are a number of web hosts available around the web today. So it’s very difficult to choose the best host and package, which can provide you the most value and extensive tech support. Here, we’ve compared three best hosting providers – Bluehost, DreamHost and Laughing Squid – which are recommended by WordPress.org. It will certainly help you choose the most suitable web host that provides quality service and great support without overspending your budget. Hosting over 850,000 WordPress sites worldwide, Bluehost provides excellent feature-packed services to customers at very low cost. It offers a number of great features like unlimited domain hosting on one account, unlimited hosting space, bandwidth and email accounts, and free domain name with your account with anytime money-back guarantee. 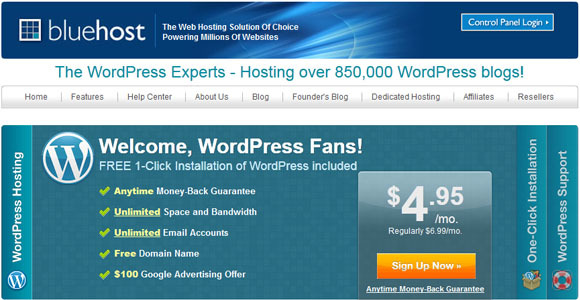 Starting at just $5.95 per month, it also offers WordPress one-lick Installation & updates with 24×7 WordPress experienced support via phone, chat & email. BlueHost servers guarantee 99.9 % network uptime, so you don’t need to worry about your site being slow. For just $3.95 per month, DreamHost provides optimized WordPress Hosting with unlimited disk space, bandwidth, email, domains and MySQL databases. It also offers WordPress one-click installation, 2 week free trial, free domain name and auto-updates with 100% uptime guarantee. Powering over 750,000 WordPress sites globally, it is one of the fast and reliable WordPress hosting providers with 24/7 technical support via email, live chat, and phone. Additionally, you can also upgrade to an optimized version of WordPress called “DreamPress”, which is pre-configured by their WordPress experts. 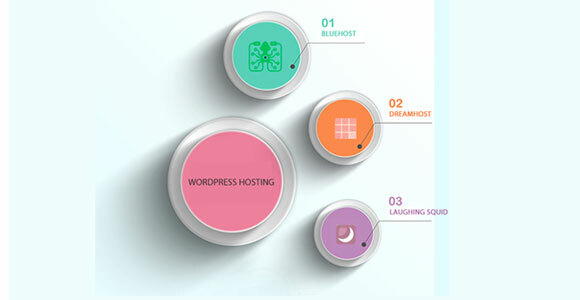 Laughing Squid provides friendly and dependable web hosting services to a wide range of customers globally, specializing in WordPress hosting for bloggers, artists and individuals, non-profits, and small businesses. The main purpose of Laughing Squid is to provide customers a great technical support and fully-functional web hosting at affordable price. 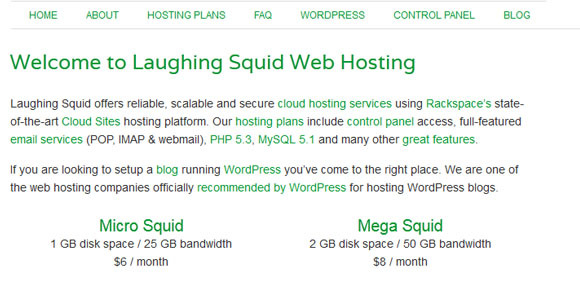 Starting at just $6 per month, Laughing Squid offers reliable, scalable and secure hosting packages that include full-featured email services (POP, IMAP & webmail), control panel access, PHP 5.3, MySQL 5.1 and other additional features like fast loading, optimum performance and minimum downtime. Look for a minimum uptime of 99.5% or higher + Money back guarantee. How much traffic the package allows and is there an additional cost over the allowed bandwidth? How much storage are you allocated and is that storage is enough for your needs? Does your host provide 24/7 technical support via email, phone or live chat? Does it allow you to set up SSL (a secure server); in case if you’re planning to sell anything through your site? Does it provide a fully-functional Control Panel according to your business needs? How many domains and sub domains can you host in your account? Does it provide Email, Auto responders, POP3, Mail Forwarding facility? How much the selected package cost? Does your web host provide all types of payment plans (monthly/quarterly/annual)? If required, upgrades are available or not? Check out the Other’s reviews, so you could know what others think about the web host you’re going to choose? Does it provide extensive technical support related to Database? Does it support WordPress script and provide simple one-click installation? How frequently does your hosting company back up the information on its servers? Click here to download “How to Choose the Best Web Hosting Provider Checklist” PDF.